Home > Play > Travel > What Is The Best Dog Ramp For SUVs? Here are some things we think you should know about car ramps for dogs. Safety First – Remember that a ramp for your dog is not only to ensure their safety into your SUV but also keep you safe. Many owners pick their dogs up and end up injuring themselves because the dog is too heavy or the dog started wailing in the owner’s arms. Measurements Matter – Measure your vehicle’s access point ahead of time so you get the proper size. Depending on the ramp you are looking at and your vehicle, the access point may be the top of the bumper, the floor of the trunk or the floor of the backseat. Measure the height of the access point and use a tape measure to estimate a comfortable angle you think your dog can handle. Look for a ramp with those specifications. Don’t push the abilities of a ramp beyond its limits. Dogs need a comfortable incline that is sturdy for their weight. 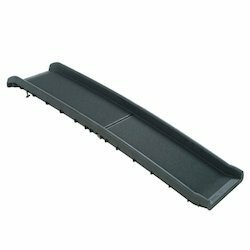 Gripping Surface – Make sure the ramp has a walking surface that your dog can grip. You may be able to add your own material to a ramp if you purchase one that doesn’t have proper material for your dog. Ramp Weight – Keep the weight of the ramp in mind. It’s good to have something lightweight that’s manageable for you to lift, but you don’t want to sacrifice quality, sturdiness or durability. Know what you’re capable of and find a happy medium. Watch Your Fingers – Some of these pet ramps have some weight to them, and we’d hate for you to get your finger caught or broken so please be careful when using these. Maximum Height 24" 32" 32" 32" 24"
We chose the best dog ramps based on technical specifications, price, customer reviews and performance. Below are our winners. We also put together a helpful summary of our best complimentary product recos for your reduced-mobility dog. The Solvit pet ramp can reach up to 24 inches high and is made of plastic. It has four rubber feet to provide a sturdy support for the ramp. The sandpaper-like walking surface gives this runway good traction. Some buyers complain that this ramp is flimsy or doesn’t have enough traction. However, we recommend making sure you only use this up to 24 inches high. It will be safer for your pet, and you’ll notice it is easier for them to use. Our #2 pick for best dog ramp for car is this Pet Gear ramp. It has a tri-fold design and folds up easily and fast. It folds into a small, manageable size that can easily fit in your vehicle. The tread on the ramp is skid-resistant whether it’s wet or dry and it’s removable for cleaning. The bottom of the ramp has rubber grippers to help keep it in place. So, what’s the downside? This ramp tends to be slightly more expensive and heavier than our #1 pick. Rounding out our top three is this PetStep folding pet ramp. It has a bi-fold design and can hold up to 500 pounds, which is the highest in our top three. The walking surface is made of a non-slip rubber material and works well whether it’s wet or dry. It has cut out handles to help you carry the ramp and has heavy-duty rubber grips on the bottom to hold the ramp in place. If the ramp gets dirty, it’s easy to wash with soap and water. The main reasons it’s not higher in our rankings is because it’s more expensive than our top picks and many customers complained of it being heavy and difficult to maneuver. If your dog uses a ramp to get in and out of the car, then it likely spends a good amount of time riding in the car. 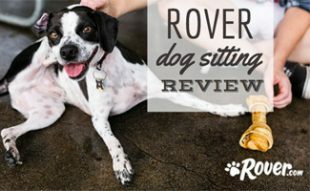 So, we put together a quick list of some of our top recommendations of complimentary products that road tripping pups and their owners can benefit from. A cargo liner can help protect your vehicle from muddy feet and excessive dog hair from shedding. If you are sick of Fido ending up in your lap rather than staying safely in the cargo space of your vehicle, you might want to add an easy to install dog barrier. If your dog’s mobility is limited from injury, arthritis, or old age, a dog sling might be a good solution to add stability and reduce pain. 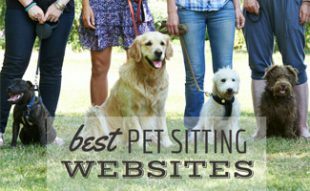 Some find that their dog enjoys a more comfortable walk thanks to this product. Below you’ll find an alphabetical listing of other companies we’ve reviewed that didn’t make our top three list. Although the Gen7Pets didn’t make our top three, it’s still a great dog car ramp. It works for dogs up to 250 pounds. It locks closed when you fold it up so it’s easier to put away since it won’t come unfolded. Customers state it is sturdy and has good traction for dogs. One unique feature is that it has a safety strap that clips to a recessed bar to help hold the ramp in place. Overall this is a good ramp, but we feel there are others that are better. Unlike the other ramps in this article, the Titan pet ramp for car has a slide design. The ramp is sectioned into three parts, and it slides into a compact design for easy transportation and storage. You can stop the slide mechanism wherever you’d like so you don’t have to extend the entire length. It has a textured surface for your dog to walk easily and large rubber feet to keep it stable. It is light weight and easy to open with one hand. It’s not ranked in our top three because there wasn’t enough customer feedback for us to review. If you want to rig your vehicle out for your dog, you may find the Nissan X-Trail interesting. It’s got everything you may need for your dog. Check out the short video below. 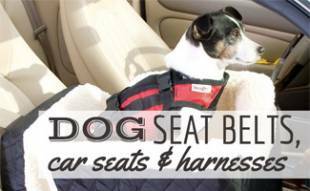 Read more tips for traveling with dogs including taking safety a step further with a dog seatbelt. 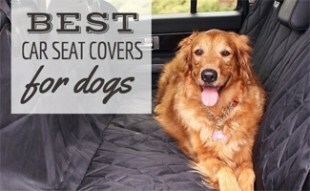 You may also be interested in dog seat covers for cars. 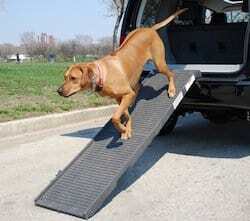 What’s do you feel is the most important factor when choosing a dog ramp for car, truck or SUV? The designs don’t take into account everywhere you may park. Instead of pointing straight to the rear of the car, how about one that mounts transversely… then it would allow you to load your pet CURBSIDE when parallel parked. Design it to fit on a bumper hitch and fold up when not in use. I haven’t purchased one yet but my older German Shepherd is over 8 years old and will probably need a ramp in a year or so. He is quite large so a ramp might be necessary. I would find the ability to reach high enough, the width, weight and how compact it is once it is folded up and put back in the vehicle during the trip. Mine won’t use a ramp period. But they will easily use Pet Loader steps. I have two 4 wheel drive SUVS; a Nissan xterra and a Ford Expedition. My dogs average around 50 lb. I have a 1 year old pug and just got a Jeep, he used to be able to jump in the front seat easily and now I have to pick him up, not that he’s heavy I just feel bad since he is used to climbing in himself. So need one of these for him!